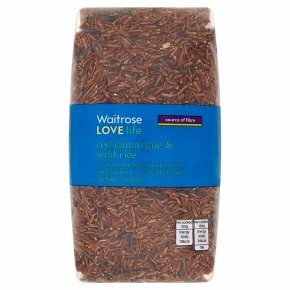 A mix of red camargue and wild rice, delicious with casseroles, or in salads and stuffed vegetables. Hob. Time: 30 -35 mins. 82g dry rice makes approximately 180g cooked serving. Rinse rice thoroughly. Place in a saucepan with three times the volume of water. Bring to the boil and reduce heat. Cover and simmer gently until cooked. Drain thoroughly before serving.